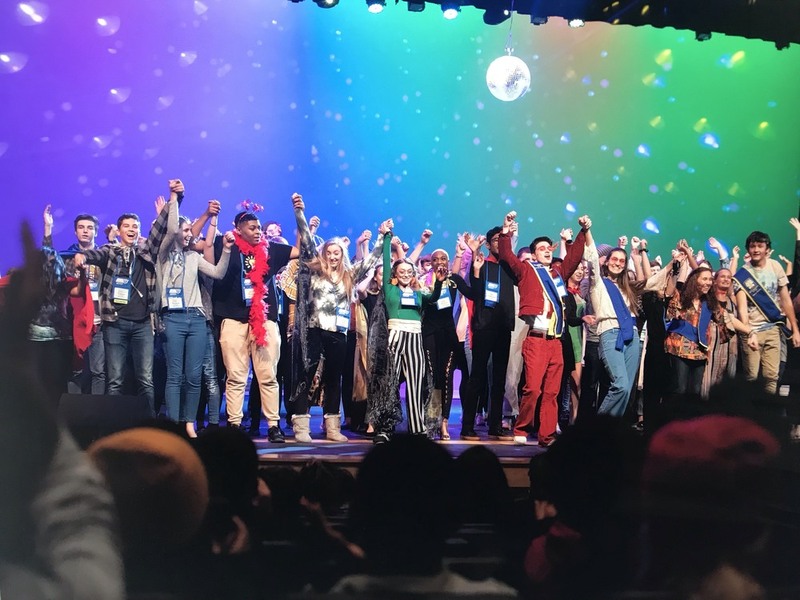 Over 1,200 participants, including students from high schools throughout the state, took over the Russellville Center for the Arts and parts of the high school last week during the 2019 Arkansas State Thespian Festival. Michelle Moss, state chapter director, said they are celebrating their 40th anniversary for Arkansas Thespians, which was founded in 1979. "This year, we have 1,222 participants and about 98 guest artists," she said. "They range from college professors to choreographers. We have a producer from New York City." While attending the three-day festival, students are offered the chance to attend workshops ranging from technical to performance theatre to learn more about those areas. "There's anything from dance to scenic painting to mask making, acting, dialect and accents," she said. "We also have a lot of film workshops for kids who are interested in going into film instead of live theatre. Our organization is honoring student achievement through their success in theatre. It's like National Honor Society, but for theatre." All the theatre troupes are from schools throughout the state, but the number from each ranges. "I have one school that's bringing two kids and I have another that has fifty-six," Moss said. "The troupes are all different sizes." Beyond students having the chance to learn new and different theater techniques through the plethora of workshops offered during the event, they also had the chance to audition in front of colleges for scholarships. "Last year we gave $1.2 million in scholarship offers," Moss said. "So those rural schools that don't really have a lot of avenue for theatre, when they come here, they have access to all of that. Juniors and seniors can go and do a college audition in front of 16 colleges. They walk in, they do their audition, they walk out and then any of those schools can offer them a scholarship." Stephanie Schultze, RHS drama, forensics and speech teacher, said this is the third time for Russellville to host the annual event. "There are choices [for hosting], but the honor for Russellville and our community is that they request us," she said. "Our facility is so wonderful, the administration is so easy to work with here. They wanted to come and be here for the 40th anniversary. They knew we would give them a quality environment." Russellville High School's Troupe No. 7260 was among those in attendance. "Our troupe consists of 65-70 students, but only about 51 could attend," Schultze said. "It starts out at a club level. By the time you graduate as a student, if you've maintained academic GPA, and have put in the hours of theatre education and study with us in the school day and after hours, you graduate as an honors thespian. It's recognized around the nation by colleges equally as Honor Society is recognized." Justyn McEntire, State Thespian Officer (STO) liaison and RHS alumni, said one of the many things the students look forward to at the festival is the Tech Challenge. "They go down to the gym and it's all for times," he said. "You're trying to get the best time on everything ... how fast you can hang a light and focus it, something you would use on stage ... how fast you can tie a knot, it's a three-knot process ... how fast you can sew a button." Schultze said the Tech Challenge helps bring attention to all that goes on behind the scenes. "Every person you see on stage, there's three or four behind the scenes," she said. "We're real big about respect. No one job is more important. So, it's a time for the techies to take their symbolic bow." "It's a fun event," McEntire added. "People get really competitive. It's a lot of fun. The techies don't get to talk or perform [during plays], so this is their time to shine." "Festivals like this around the country give these kids a chance to see there's a larger world than their building and there's a purpose and something to go beyond high school if they want to," Schultze said. "Whether they go into other careers or not, what they're learning here is a skill they can take into any career."